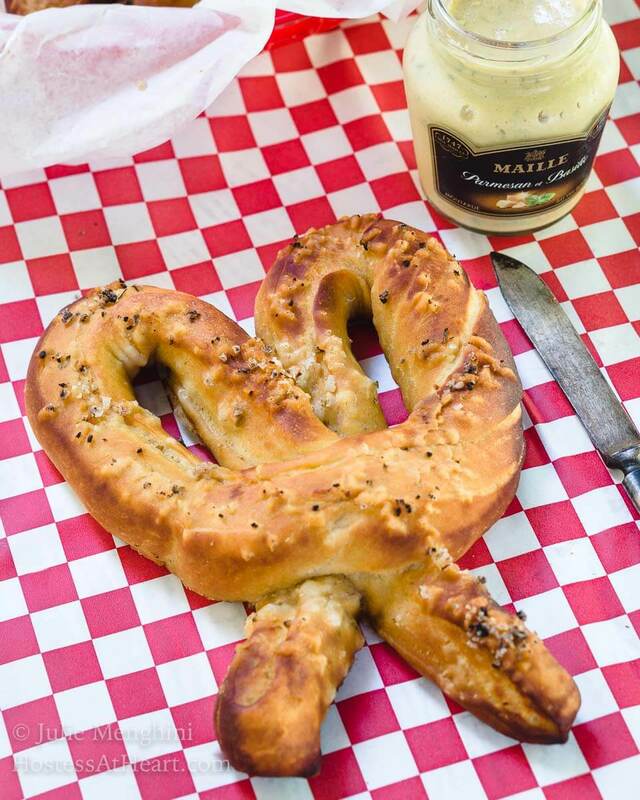 This German Soft Pretzel recipe has that perfect pull when you bite into them and a soft and tender center. 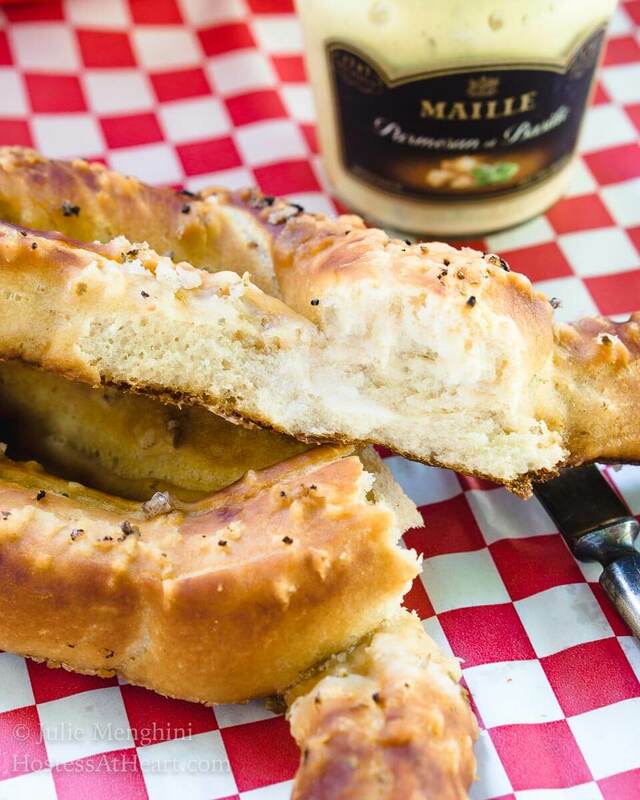 These pretzels are so good they don’t even need a dipping sauce. 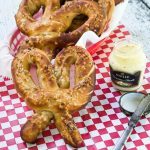 I’ve made pretzels several times, but this German Soft Pretzel recipe proved to be one of the easiest, best tasting and least messy. They are perfect for this month’s BreadBakers theme “International Breads” chosen by our host Wendy who is the creative genius behind A Day in the Life on the Farm. The only request was that we weren’t supposed to pick a recipe from our own country. When you say International Bread, that gives you so many to choose from. I believe that every country has a bread recipe that they are known for. I also believe that some breads are made in different countries with different names but are still very similar. For example flatbread. Flatbread could be defined as an Italian Pizza Crust, a Greek Pita, or an Indian Lachha Paratha and much more. Most are a combination of flour, water and salt rolled into a flat dough. Some are unleavened but that’s not always the case either. Perfectly clear right? I didn’t choose flatbread for this challenge. I chose a German Soft Pretzel Recipe also referred to as Laugenbrezel (Traditional German Pretzel). My friend Google and I did some searching and found that somewhat true. There have been some variations but most of the pretzels still claim German heritage. One thing I liked about this recipe is that it went much quicker than some pretzels that I’ve made. They can also be a huge mess with the boiling and baking. These pretzels are boiled at a much gentler boil and a quick bake time which really reduced the fuss and the mess. They’re perfect to eat as is but John liked his with some amazing French mustard my daughter brought us from France. I also used a garlic-parsley sea-salt that she also brought us from France. Yep, I have a very generous daughter that is a talented little cook. 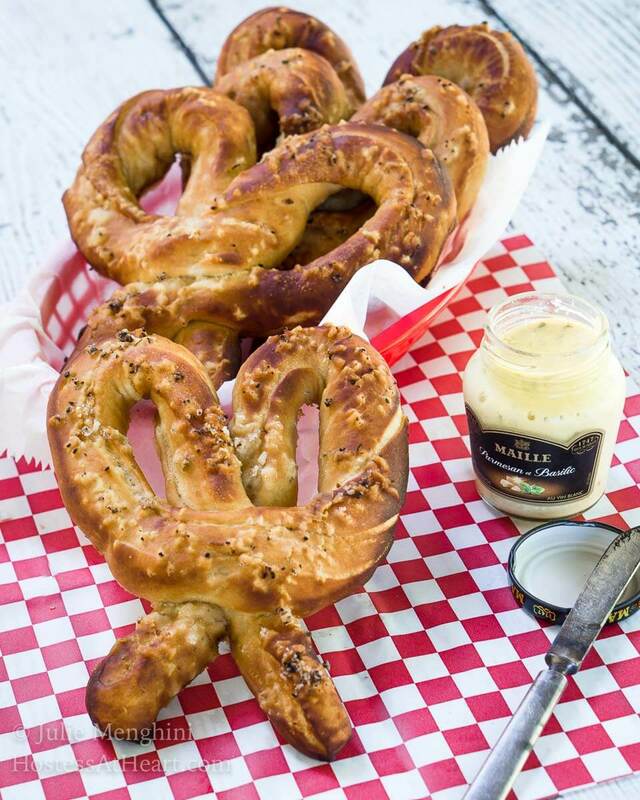 This German Soft Pretzel recipe has that perfect pull when you bite into them and a soft and tender center. 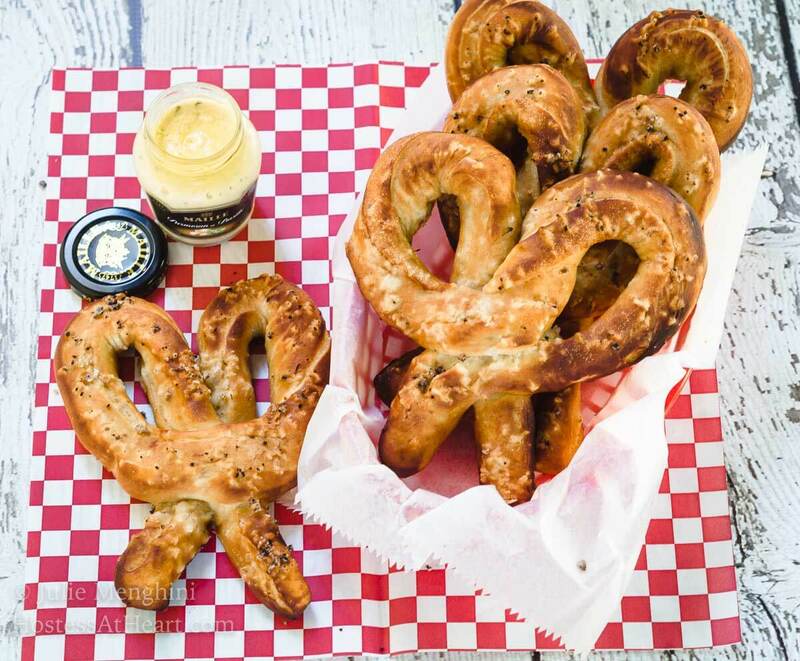 These pretzels are so good they don't even need a dipping sauce. Using a medium-sized mixing bowl, combine the warm water, yeast and Barley malt syrup. Set aside and allow to proof for 10 minutes or until foamy. Using the bowl of an electric stand mixer, combine the flour and salt. Whisk to combine. Cut in the butter using your fingers until the butter is crumbled into the flour. Pour the yeast mixture into the flour/butter mixture and using the paddle attachment, mix until a shaggy dough forms and water is absorbed. Change to the dough hook and mix on medium speed until dough is smooth and elastic, approximately 6 minutes. Cover the bowl with a clean damp towel and put it in a warm area for 2 hours or until doubled in size. I put it in my oven without turning it on. Preheat the oven to 450°F. Spray two baking sheets with non-stick spray. In a large sauce pan or dutch oven, add 8 cups of water, baking soda, dark brown sugar and beer to a boil. Reduce heat and maintain a simmer. Roll the dough out into a 14x12 inch rectangle. Cut the dough into 1-inch strips. I used a pizza cutter to make my cuts. Roll out each strip into 30-33-inch ropes. To form pretzels, loop a strip into a "U" and cross the ends at the bottom. Bring the top of the "U" down the crossed pieces and pinch together. Boil each pretzel separately for 30 seconds. Remove with a slotted spatula so water drains from the pretzel and place it on a prepared baking sheet. Repeat putting 6 pretzels on each baking sheet. Sprinkle each pretzel with pretzel salt. It's easier while they're still wet. Bake for 5 minutes and then rotate the baking sheet. Bake an additional 5 to 8 minutes more or until pretzels develop a dark brown color. Remove pretzels to a wire cooling rack. Allow them to cool slightly before serving. Serve with mustard, melted butter or cheese sauce. 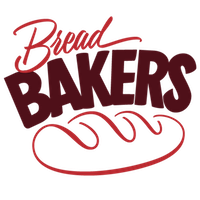 Just like our recipes, our BreadBakers group is a diverse group of bakers and I am really excited to see what everyone brought! I still have to get my hands trained to shape pretzels, but the recipe is so tempting that I cannot wait to try them quicly. Thanks for sharing. Thank you for stopping by Sonia! These pretzels are very good. I will make them smaller next time though which will make them easier to handle and a better size for serving. Your pretzels look awesome Julie. Love the shape of them. Loved to read the write-up. Your pretzels look beautiful and delicious. You’ve explained the procedure so well. Never baked pretzels before. Your post prompts me to try them out soon. Thank you so much Namita! That’s why I love this bread group! It opens my eyes to so many recipes. With a German recipe, I guess beer can’t be too far off 🙂 Beautiful pretzels. I’ve yet to try out making pretzels at home. Thank you, Mayuri! I think the beer contributed to the briny exterior. They were definitely delicious! First of all, what a nice daughter to bring you such thoughtful presents! You raised her right! The pretzels look delish. We were in Germany last fall and saw big beautiful pretzels just like these in all the bakeries. Thank you Eileen! My daughter is an amazing person in so many ways. These pretzels are so good that I’ll be making them again. Thank you Debbie! Happy Friday! I love pretzels! These look yummy. Bread is wonderful, no matter what it’s called or where it comes from. (in my opinion). I’m with you, Patti! I love a great bread and don’t waste the calories on the boring stuff. How interesting that there is beer in the boiling liquid! these are gorgeous. I would eat a whole one in a single sitting. That seasoned salt from France sounds delicious too. Thank you, Karen! These were really good and I think next time I make them they will be half the size. Thank you, Jess! I think this was my most successful version and the least messy so I can stop searching for the perfect one. I’ll make them half the size next time though because I couldn’t eat a whole one. Enjoy your day my friend! Absolutely love these pretzels! Are these similar in taste like Aunt Annie’s? I love those pretzels!! Is there any other Substitute that I can use in place of barley malt? Those pretzels look so beautiful and inviting. Thank you Sowmya! They were fun to make too but us bread lovers like it all don’t we? So glad you made it in time. Wouldn’t have wanted to miss out on these amazing pretzels! It was done and I was in the shower when I started thinking of the time change! Next time I will just schedule it. Thank you for your patience, Wendy. I really enjoy this group and our events.